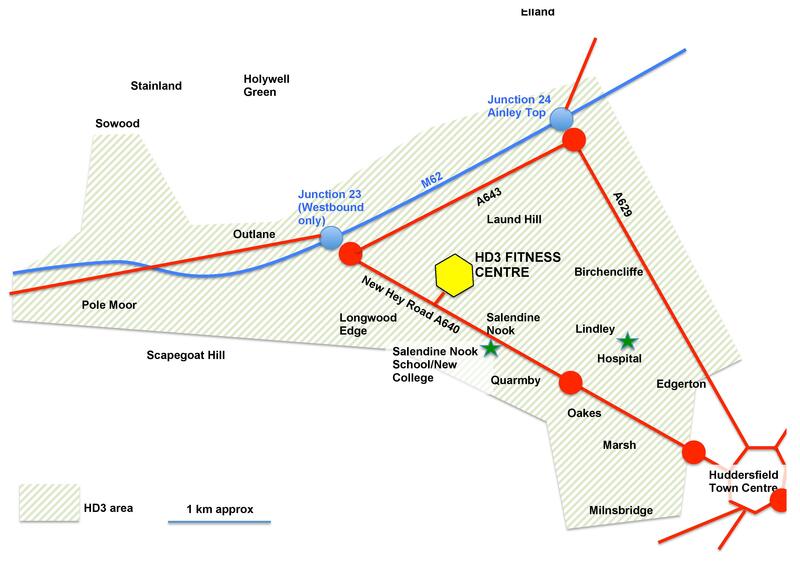 HD3 Fitness Centre can be found 4.5 kilometres (2.8 miles) north-west of Huddersfield town centre, in Salendine Nook, just off New Hey Road (A640). It is on the right-hand side as you leave Huddersfield, 500m before reaching Junction 23 (Outlane) of the M62. This is 600m further uphill from Salendine Nook High School/New College, but on the right-hand side of the main road. (Note: New Hey Road can only be accessed from the west, off the M62. Ainley Top junction, Junction 24, offers easy access from all directions off the M62). As the Fitness Centre’s home is on the first floor of the Huddersfield YMCA headquarters, look out for signs actually on the main road (New Hey Road) indicating both Huddersfield YMCA and HD3 Fitness Centre. The parking and the main building are both obvious once you have turned off the main road. Parking is more than ample and spaces adjacent to the Fitness Centre are always plentiful other than on important match days when the car park gets busy.